“Betsy” was operated by the Madera Sugar Pine Lumber Company near Yosemite. The company began in 1899. This little engine was eventually scrapped in 1937. When steam came to the woods just after the turn of the previous century the logging locomotives were the cutting edge of technology. They could move logs farther, faster and in much greater quantity than had been done with horse and oxen. Before the logging railroads the mills were small and often had to be moved, since the log supply had to be within reach of a team of oxen. The logging railroads allowed larger mills to be built because of the much larger area serviced by the railroads. Often the Sierra mills had their own dedicated logging railroads that didn’t connect to any mainline. They would build spurs to logging areas. When the logging was done, they would tear out the spur and re-lay it into a new logging area. Steel was expensive so they reused all the hardware. Back then the mills were built in the woods to be close to the timber. It was more efficient to move the lumber from woods to the cities than it was to move the logs to the cities. When the logging truck came onto the scene the loggers no longer needed to build rail spurs and instead built truck roads. This allowed quick access to areas that couldn’t be reached with a logging railroad. As a result mills could go farther to acquire logs, which resulted in mills being moved from the woods to the cities. 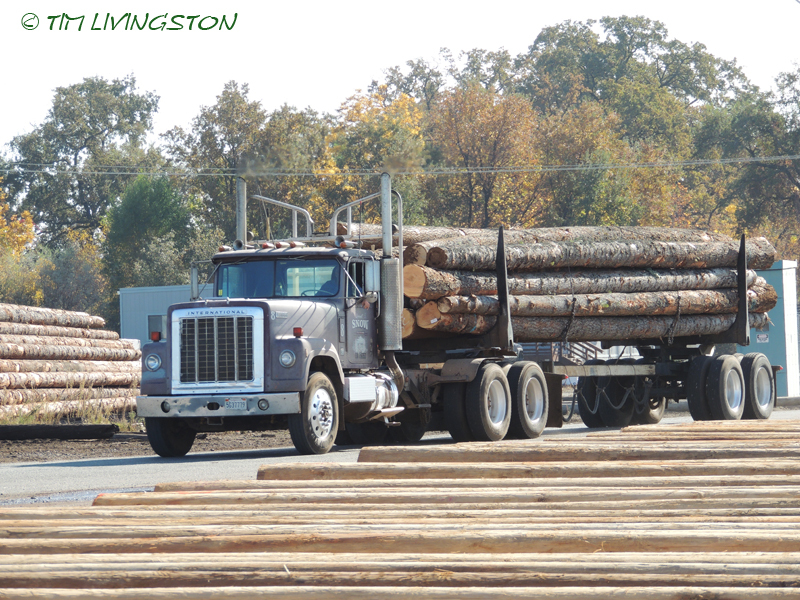 Logs arrive at the mill. 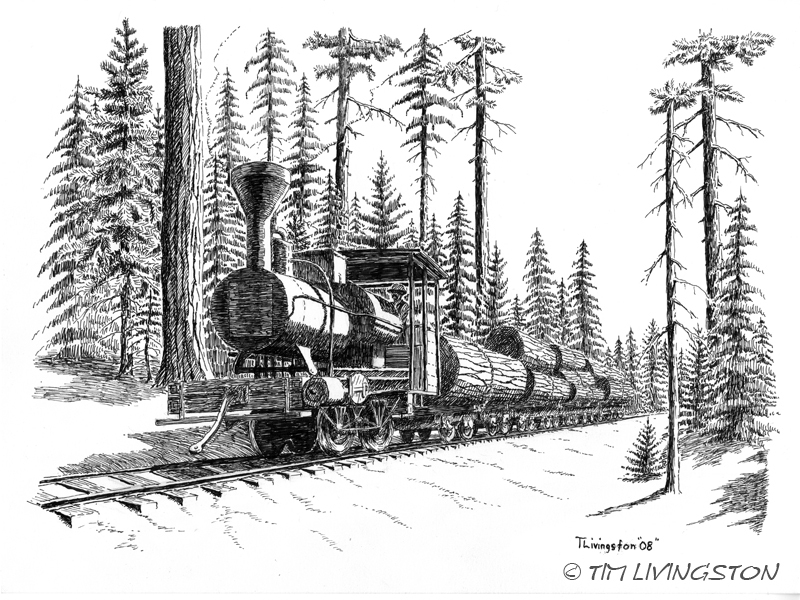 This entry was posted in Drawing, Forestry, Pen and Ink and tagged drawing, Forester Artist, forestry, historic logging, locomotive, loggers, logs, pen and ink, railroad, timber by foresterartist. Bookmark the permalink. 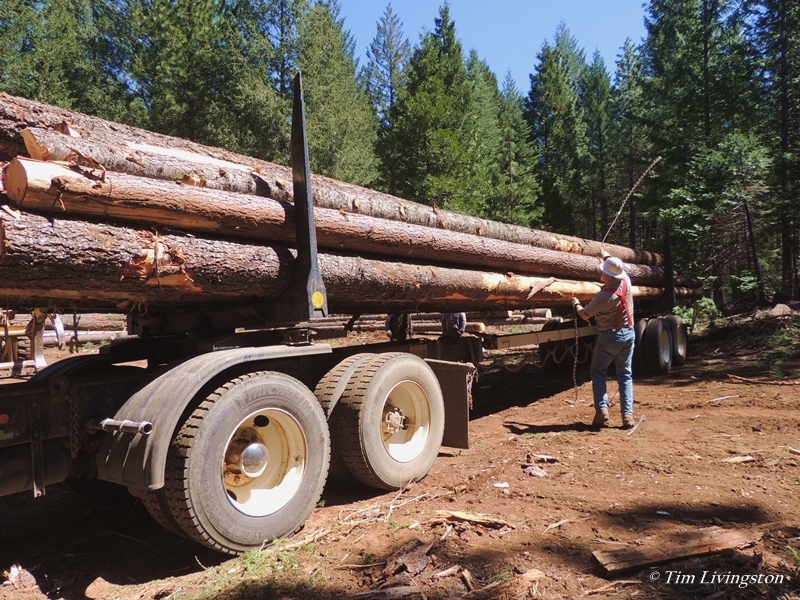 Thanks for the post about the history of logging. I love Forestry Friday. Favorites from this post include your title, factual background, and especially “Betsy.” Very well done! Thank you so much Linda. I glad you like it. Great sketch of Betsy and an interesting bit of “logging history”. That Blitz brings back memories our Goldie “Bow”, now long gone. Thanks for the great photos of your pal. Thank you Zach. 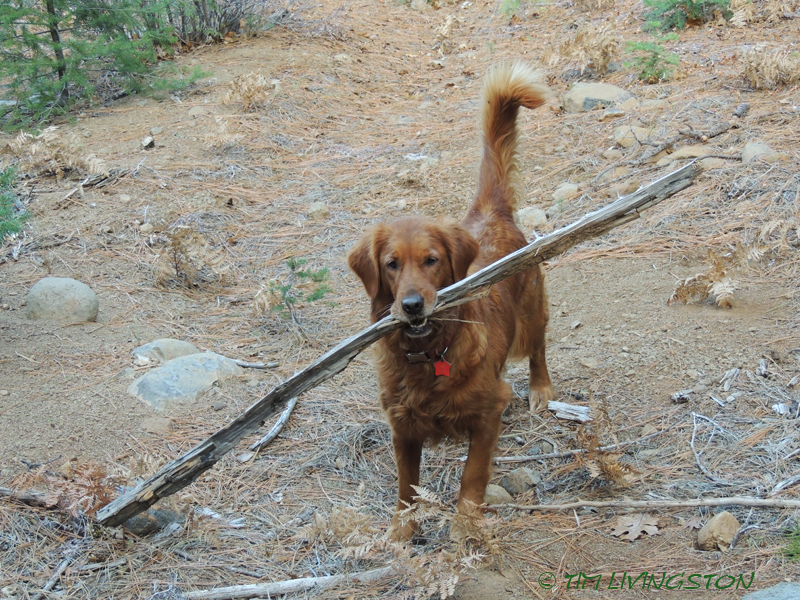 Our first golden was a “Bo.” I think old Bo traveled more of the Sierra then most people. Interesting story on the history of logging. That’s a pretty impressive piece of wood Blitz is carrying. Alex is going to need a job as he grows and I may just show him some of Blitz’s feats. I really like the eduactional posts. So interesting. The photos are great too. Wow. Thise logs are big. Makes me wonder where and how the lumber will eventually be used. The pic of Blitz is too cute. After all she had to be a part of the action. Blitz is always in the thick of it. The really long logs are going for utility poles. The shorter one for lumber. I remember the first time I saw a huge logging truck (don’t remember where, though–but probably either somewhere around Yosemite or else somewhere in British Columbia). The first things that came to mind were 1) I hope that thing stays on its own side of the road, and 2) I sure hope it has good brakes! I don’t know Alli, you were asking a lot! Truth be told, it’s always the rock truck drivers that scare me. I’m beginning to wonder about Blitz and Ted. Cats and dogs plotting together! What is wrong with the world. I’m glad to enlighten about forestry. That and having fun is my mission. No wait, having fun is your mission! We watch it too. I feel like I know those guys. Just like the loggers I know. Well, sort of… I haven’t been on too many jobs where the loggers are constantly yelling at each other! 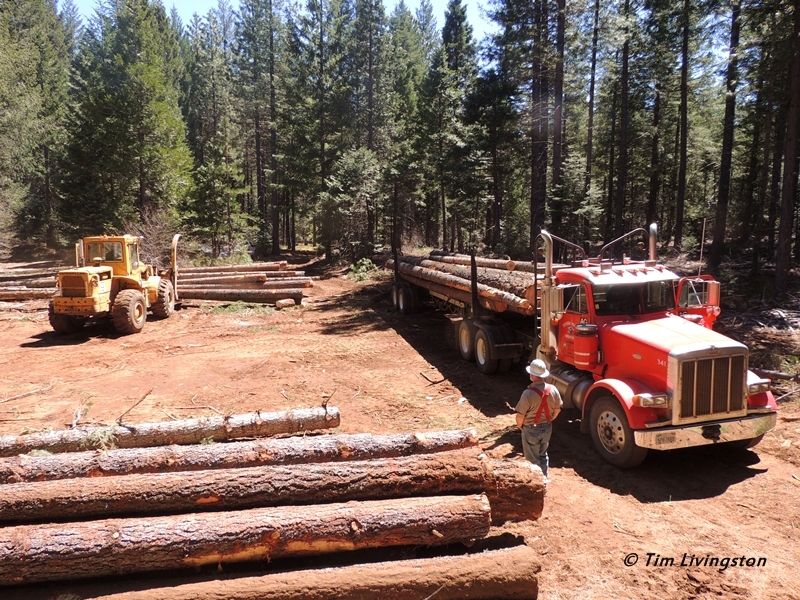 LOL If those guys are as whinny as they are portrayed on TV, they could never handle the logging jobs we have in northwest CA where the trees are bigger, terrain steeper, and more complex environmental regs. That’s true, however they are out there. I’ve met Mike Pihl from Axemen, and said that they edit for maximum drama. He shook his head and said it frustrated him because it made the crews look like you describe. Thank you Nicky. Blitz used to ride strictly in the back of the truck, but now she has been promoted to the front. Next she will expect to drive. Great read and informational! Blitz seems to always want sinew lime light! Funny dog! That’s Blitz….the camera loves her! What a nice thing to say Ajay. Not everyone likes the loggers very much. Thank you Rose, I’m so glad you enjoyed it! Hello there, I just came across your blog. It’s quite interesting, I especially liked this post. Thank you again. It is my pleasure to have you visit!